High capacity with a small footprint. This high capacity stand alone food and frozen machine that fits through a 32” doorway. The Combi 3000 features next generation air flow architecture allowing it to dispense refrigerated and frozen foods from the same machine using a common delivery fall space. Machine can be utilized in a Small Medium and Large locations. 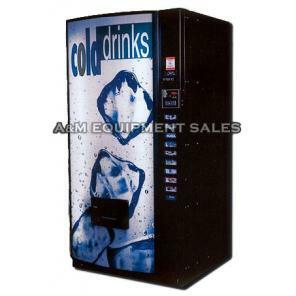 Available at $6700, Combi 3000 Frozen Vending Machine is a good catch for your restaurants, shops and homes. The new Combi 3000 Frozen vending machine comes with high capacity and smaller footprint. This high capacity stand alone food and frozen machine easily fits through a 32” doorway. The Combi 3000 features next generation air flow architecture allowing it to dispense ice cream and frozen foods from the same machine using a common delivery fall space. Machine could even be utilized in a Small, Medium and Large locations. The Combi 3000 Frozen Vending Machine sells ice cream and frozen food all in one machine. High capacity with up to 540 items and moves easily through most entryways. American’s with Disabilities Act (ADA) Ready. LED lighting enhances product presentation, requires no service for minimum of 5+ years and reduces lighting energy costs by 73% over fluorescent equipped models. Convertible in the field to fully refrigerated or fully frozen. Two Separate Food Zones Vend refrigerated foods from the top zone at 36°F and frozen deserts at -15°F from the bottom. Built-in, full color 7″ LCD screen replaces traditional keypad & display. Attractive interface styling panel option. Standard peripheral opening for additional payment or POS systems. Back lighted keypad with Braille identification. MDB support for all industry standard devices including cash, coin, debit and credit systems. Full featured controller with sales and accounting. Price setting by selection, row or machine. Free vend and Combo vend modes. Flexible space to selection setting. Time of day shutdown modes for energy savings and secured vend times. Programmable point of sale messages. Programmable coupon and token values. Coin and bill rejection rate counts. Accountability display by selection, row or machine. LED Lighting Enhances product presentation promoting more sales. No bulb servicing for 5 years. Energy efficient and eco-friendly. iVend Guaranteed Delivery System Keeps customers satisfied and reduces service calls for misloaded product.